Dining out is about so much more than just food on a plate. With thousands of restaurants vying for our attention, diners are spoilt for choice when eating out. So what is it that makes the ultimate dining experience? We think it comes down to attentive service, a welcoming ambience, and wherever possible, that all-important ‘wow’ factor. This week, we’ve rounded up five restaurants with some of the most awe-inspiring views for memory-making meals. 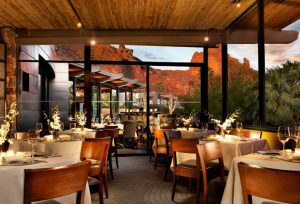 Scottsdale Arizona is well known for its stunning sunsets and desert vistas and Elements restaurant offers the most perfect natural viewing gallery. Located on Camelback Mountain, the restaurant is part of a luxurious resort offering its guests serene tranquility as well as stunning views. For a truly one off experience, private dining is available on one of a number of stunning terraces that overlook Mummy Mountain and the famous Praying Monk rock formation. 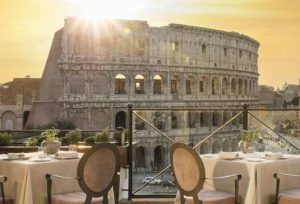 If you’ve always dreamed of visiting the Colosseum in Rome, then a visit to Aroma at the Palazzo Manfredi Hotel gives you the perfect viewing platform. Awarded a Michelin star for its cuisine, you’ll struggle to find anywhere else in the city that rivals the uninterrupted view of one of Rome’s most famous landmark from Aroma’s terrace. Nestled under an ancient limestone cliff on Phranang beach is The Grotto, a laidback eatery that belongs to the Rayavadee resort. Barefoot relaxation is the order of the day here with cocktails, salads and nibbles available in the most stunning seafront surroundings. In the evening, you can indulge in a beach barbecue as the sun sets and if a table and chairs seems too formal, there are sofas and loungers for a laid back vibe. There are few more exciting experiences than spending a night on safari and at Ngorongoro Crater Lodge, the experience is taken to a whole new level. Luxury camp guest rooms marry gilded mirrors, decadent chandeliers and four poster beds with eye-popping views across the crater. From the restaurant terrace, the views are no less spectacular and guests can indulge in stunning cuisine whilst wildlife spotting. On the soda lake are flocks of flamingos and black rhino, hyenas, lions and elephants roam free across the plains. In Dubai it’s hard to pick just one restaurant with amazing views but we think PierChic has to be one of the best. 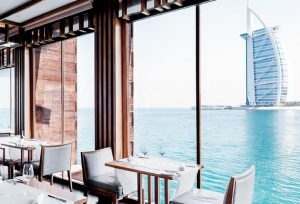 With sensational views across the Arabian Gulf, dining here is a true ‘over-the-water’ experience. The restaurant is officially part of the Jumeirah Al Qasr hotel, but with its remote water location guests need to take a stylish rickshaw from the main hotel building down to the pier. From the dining area, guests are afforded unrivalled views towards the iconic Burj al Arab hotel, or a birds eye view of the sparkling Dubai skyline.